From traditional designs to more modern and sometimes wild concepts, the Adirondack style is perfect for the porch, fire pits as well as the beach. 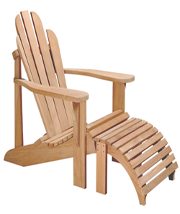 Today's Adirondack chairs usually feature a rounded back and contoured seat. Originally designed around 1938, the Adirondack style has also been translated to other pieces of furniture, from gliders and bar chairs to love seats.